The CSL Second Division remains highly competitive early into the spring season. The two top teams in the South Region, Stal Mielec NY v. Polonia Gwardia NY, played in the Polish derby for top billing and multiple teams in the North Region have a fighting chance for a playoff spot. Two in particular, NYPD FC and Manhattan Kickers, have been on a tear since the regular season resumed. A goal midway through the second half is all that seperated Brishna and Central Park Rangers Reds in their match on Saturday. With the 1-0 win, Brishna sits just on the edge of a packed D2 North Region where second place and seventh are separated by only four points. While the result is not what the team wanted, CPR Reds team captain Mike Lindley saw his group improve after last weeks loss, 6-1, to CD Iberia. He also knows just how difficult Brishna can be as a foe. Some of the best chances for CPR were thanks to the returning Endo Mhilli, who rejoined the squad after missing all of the fall season due to injury. Despite not fully being back to his old self, Lindley says Mhilli being back is one of the biggest boosters the team has. Mohammad Mustafa Mohammadi scored the game winner in the 65th minute during a scramble in front of the net. During the chaos, Mohammad Yosef Mashriqi collected the ball and fed Mustafa who tapped the feed past the keeper. CPR nearly equalized five minutes later when a tactical error left the Brishna net completely open and the ball carrier only a few yards out. But the ensuing score attempt sored over the net and off the field. The Brishna backline expanded to six defenders for the remainder of the game which saw out any other CPR chances. “It was a huge disappointment to miss out on an opportunity to gain some valuable points against a team we had success against in the past,” Lindley said. Real Ole FC won its second straight game this spring and third straight overall, 5-1, with a mix of early scoring and a ferocious late game surge against CD Iberia. Iberia's loss means the team losses the chance to sit in second place on the D2 North table this week and allows Real to stay in the hunt for a playoff spot and potential promotion to D1. According to team manager Carlos Vazquez the team faced an uphill battle from the start against an already difficult opponent. “Iberia had three starters play with the reserves team and with no subs we couldn't keep up with Real Ole's rhythm,” Vazquez said in his post-game report. Fernando Cortez scored for Ole early in the first half off an assist from Kevin Davis, but Iberia kept the pace and put up good chances. After multiple attempts from both side, Nuno Mecia kicked in the equalizer in the 60th minute to level the score, 1-1. Despite this and the game beginning to lean in Iberia’s favor, a foul on Real Ole’s Patrick vonEgypt in the box sent Fernando to the penalty spot. The kick was good and the team wouldn’t look back from there. Fernando would finish his hat trick with a third goal, once again assisted by Davis. Then on a corner kick vonEgypt found Jay Moseley’s head. The final goal in the game came late when Nick vonEgypt got a feed from Ethan Eustace on a breakaway attempt and finished before the game ended a few minutes later. NYPD FC continued its spring season surge as it blazzed past D2 North leaders KidSuper Samba AC, 6-2, inching the team closer to a potential spot. Of the top five teams, the only team without 18 or 17 points is KidSuper (25 pts) - meaning the second playoff spot is up for grabs by a number of teams immedietly. With its' performance today however, the region leading visitors may have shown the top spot is also available. Sambra was the first team out of the gate following the opening whistle. Jamar Hooke scored for his team early on, with Yankuba Janneh getting his third assist of the season, in what would be the only lead KidSuper would have in the game. Following the slow start, New York’s Finest FC slammed their feet on the gas and never looked back. The team beat the KSS keeper three times to take the lead all before the midway point of the game - including two from Tom Kcira and one from Artan Balaj. Kcira’s two goals bring his season total to six, tying him with Patrick O’Callaghan for the second most on his team behind Gino Cipriano (7). Frustration and desperation began to set in for the trailing region leaders as Khadim Ndiaye picked up two yellow cards between the second and third NYPD FC goal, meaning his team would play the entirety of the second half down a man. The game was fully controlled by the home team from there including its’ opposition only goal in the second half. Samba’s Ibrahima Bah shot hit off NYPD’s Shane Wittemann to deflect into the net in the middle of the second half and would be the most offensive thing the team did. Balaj scored two more times for the hattrick and Demetre Vernon tacked on a goal of his own to finish the game. At six goals allowed and a four goal difference, the loss is KidSuper’s biggest of the season and one of NYPD’s biggest - a huge reversal from both team’s previous encounter that opened the fall season where KidSuper Sambra demolished the visiting police force, 8-1. Despite missing a few players, Manhattan FC won its second game in a row, 2-0, against FC Japan on a windy Randall’s Island. The game was tightly contested throughout with both sides getting few chances on the opposing net. It all came down to which team was able to break through and Sunday it turned out to be the home team. The Kickers got on the board early after Francois-Xavier (FX) Thiolliere scored the opening goal ten minutes in. The rest of the first half was quiet on the production front but head coach Bryan Baracaldo praised his back line, specifically Hashim Allahmorad and Bartek Malinowski, for their work keeping their opponents away from any potential chances. FC Japan held off Manhattan for a total of 60 minutes after the first goal, but Brian Morris sealed the game with another score in the 75th minute. Following the match FC Japan defender Yukihiro Mitsuno praised the Kickers play but acknowledged his team’s growth over the past few months - including the win over Williamsburg International FC last week. 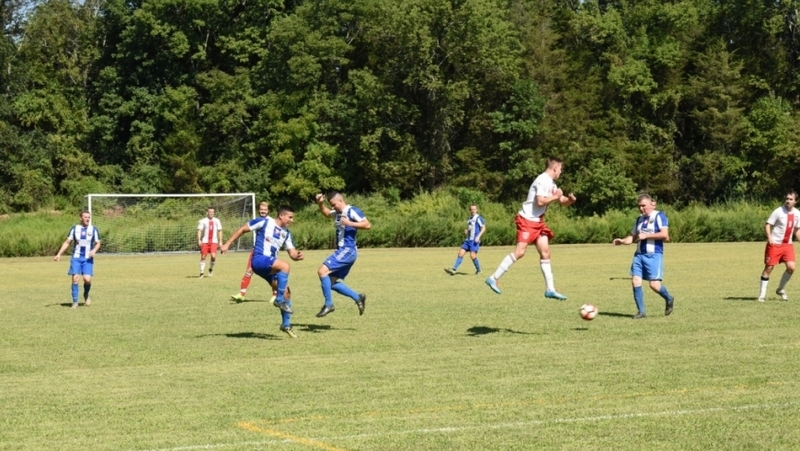 In the battle for first place in CSL Division 2 South, Polonia Gwardia NY retained its top spot for another week with its’ win, 2-1, and put some distance between second place Stal Mielec NY. Despite coming into the derby match with a better record (6-1-1) over the fellow polish heritage side, Stal fell victim to the same defense that has been a nightmare to opponents all season long. A late goal from Gwardia’s Marcin Januszko lifted the team from what looked like a definite draw after 90 minutes of solid defensive play from both sides. Stal’s offense missed out and wasted a majority of its chances and gave the visiting team a chance to find the all-important winning goal. The game was mostly played in the middle of the field to start off. Neither side had a clear shot on net until mid-way through the half and even then nothing looked threatening. As play went on corner kicks and tight defense became the norm. Radosław Kucharski started the scoring early in the second half, giving Gwardia the first lead of the game. Stal bounced back in the 66th minute when Jacek Lawniczak's center found the feet of Ismael Coulibaly. The latter's equalizer snuck in past the out of place goalkeeper. Polonia Gwardia plays next Sunday against the Manhattan Kickers who have been on a offensive tear as of late. This will be the team’s biggest test in terms of defense early on this spring. For Stal Mielec, they play the struggling Panatha USA in Sunday’s late game. In their first match of the spring, FC Ulqini picked up a win, 3-0, against the NY Ukrainians that demonstrated why the team is one of the top three most prolific goal scoring units in the South Region of Division 2. The Ukrainians were coming off a rout of second place Stal Mielec NY in Week 11, 5-0, but could not follow up the success in its match this week. Fjodor Cepe scored twice for Ulqini and Albert Ruci rounded out the final tally with a goal of his own. Since Ulqini are one of three teams to only play 10 games so far this season they, currently in 5th place, are at an advantage when it comes to standings. A win next week would put the team at 21 pts, the same number as Williamsburg International FC who will be on a bye from regular season play. FC Spring Valley’s losing streak extended to eight games as the team fell to Manhattan Celtic, 6-0, at home on Sunday night. Valley has been outscored 29 to one since the beginning of last November. For a team that had only scored 20 goals on the season heading into the contest, Celtic demonstrated how productive it's offense could be and used the game to play some younger athletes. Northeastern University athletes Marc Greenblatt, Daniel Arvidsson, and Dan Korman, all put time in during the 90 minutes. Korman in particular stood out during his debut for the team as he assisted on two goals. Goal scorers included Jamie Reily, team captain Marco Charnas, the young Ardvisson, Henry Smith, Augusto Tono, and Jon Leon whose score just before halftime sealed the game for his team at 2-0 and kept the momentum firmly away from Spring Valley. Next up for Celtic is a match against Real Ole FC on Sunday, March 31. With a win, Real could catch Celtic in terms of points while Celtic could be jumped in the tight table standings between the second and seventh place in D2 North. FC Spring Valley will play Central Park Rangers Reds on Saturday, March 30.